As our office continues to upack the latest Census data, we will share some of the findings here, and in our quarterly forecast presentations and documents. 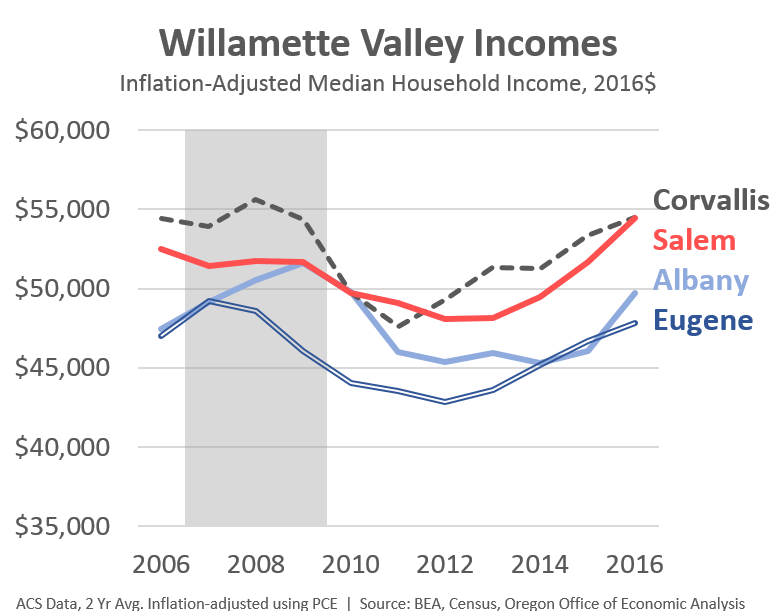 Today, a quick look at household incomes across Oregon’s metropolitan areas. We will wait for the 5 year ACS, and SAIPE data later this fall before digging into rural trends. We start first with the state’s largest metro, Portland. Inflation-adjusted incomes now stand nearly 9 percent higher than before the Great Recession. The typical large metro has yet to fully recover its losses. As I dug into the data, I was honestly surprised at how well Portland has done across a host of key economic metrics. I will have more in the next week or so on these findings. Next we turn to the Willamette Valley. This is an updated chart we discussed a bit more in-depth this summer and it comes from some of the Salem outlook work I did as well. Like Portland, the trends here are about an improving economy beginning to approach full employment. 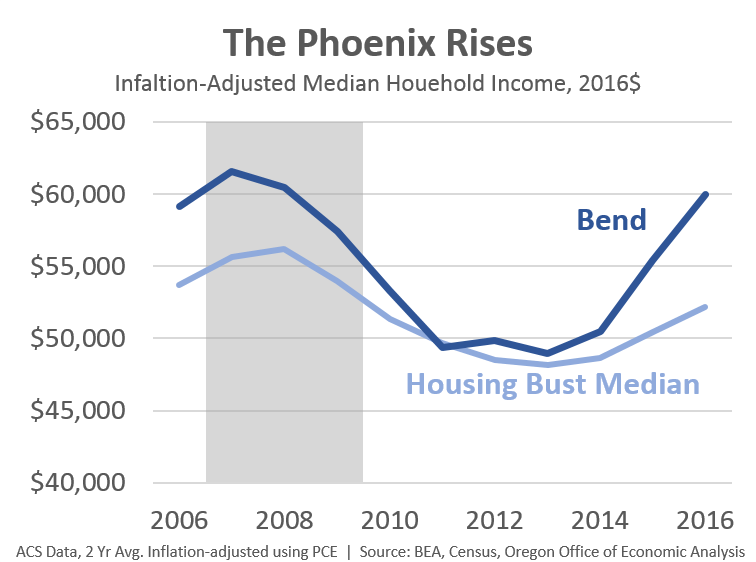 Third we take a quick look at Bend, the boom-bust phoenix of our time. Out of the 50 worst housing bust metros in the nation, Bend ranks 5th best for median household income, and has clearly outperformed the typical one. The economy is likewise approaching full employment, when the feel-good part of the business cycle comes into view. Finally we take a look at the Rogue Valley. Here the story is a bit different. 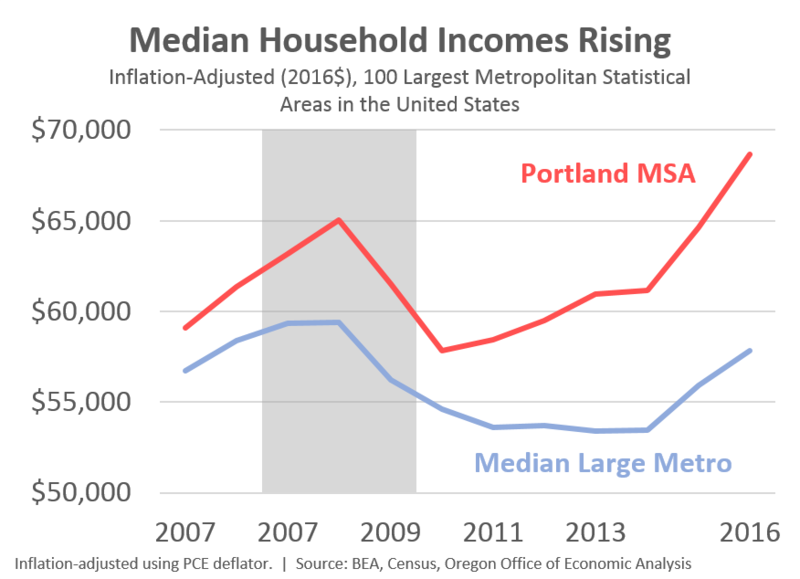 Medford is also one of the worst housing bust metros, and against that backdrop, Medford is doing OK. Household incomes in Medford have declined less than in the typical housing bust region, and have regained a bit more than usual. 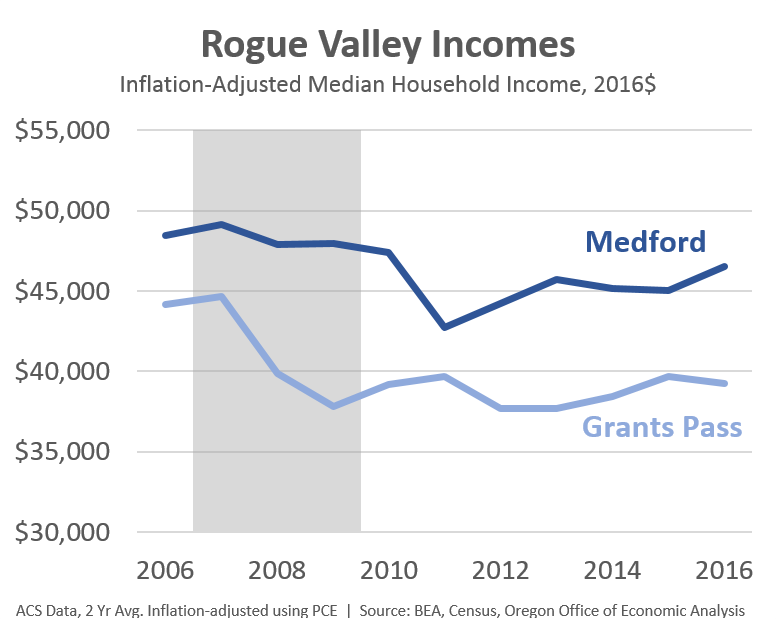 That said, Medford, along with Grants Pass have yet to regain their Great Recession losses and their regional trends differ from the rest of Oregon’s metro areas. Previously our office looked at Grants Pass (Josephine County) and expected the income numbers to turn around. Not so in the 2016 ACS data at least. This warrants a deeper dive once the microdata is available in a couple months and is on the research agenda.